With our Power BI demo contest in full swing, we wanted to provide some quick tips around guidelines, demo creation, and Power BI features & tools that you can use to bring your demo to the next level to improve your chances of winning some great prizes! First and most important: How will your demo be judged? Make sure you have read and agree to the Official Contest Rules. The first stage of judging will be community voting, so think about your audience: other data enthusiasts like yourself. Think about the best video length for getting and keeping viewers’ attention. Make sure there’s a story behind your data. Data for the sake of data is not enough. Design is key. Power BI allows you to create amazing visualizations. The more visually attractive your demo, the better. Use the tools that Power BI gives you to make your demo look amazing. Think about the theme behind your story, and apply it to your entire demo. The more Power BI features you can showcase, the better. But remember to find some purpose behind the features you use and keep your demo to an appropriate length. Use data that gets people’s attention. Sports, entertainment, global economy, and social media are hot subjects when it comes to data analysis these days. Name your demo in a way that describes the story behind it. The demo title is another tool you have to grab the viewer’s attention. 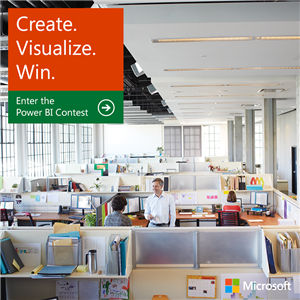 Briefly show how Power BI empowered you to create your demo. For example, mention how it helped you to obtain and transform your data. Edit your video: don’t show everything from end to end. Tell your story selectively. Maximize creativity: use slides, in-screen text and other tools in your video to set up a problem or summarize findings. Shorter is better. The longer your video, the more likely it is to lose viewers’ attention. Choose wisely what you include and leave out. When you record, use the highest resolution and best audio quality possible (for best results: 16 x 9 aspect ratio at 720p). Avoid background noise and clunky transitions that can distract your viewers. You’re creating a Power BI demo video. Don’t make a video that feels like an ad. Spend some time playing around with your data and the different features of Power BI. That will give you a nice pool of ideas and functionalities to use in your demo. Pick one story and combination of features that you think will be the most attractive. Write a script and create a rough storyboard to get an idea of how your demo will flow and look. You can use the script later to record your video and voiceover. Record a video of your demo-building experience with a test voiceover you can use later as a reference. Build any supporting materials, such as slides, sound effects, or diagrams that you’ll plug into your demo later. Edit your demo video, and record your final voiceover using your script, storyboard, and final-version video. Power Query: Highlight online search and URL import features that made your Power BI task easier. If you had to manipulate and transform your data to work with it, it is important to highlight that, too. Power Pivot: If your demo includes a data model, hierarchies, and cross-references, consider highlighting how fast and easy this was, using Power Pivot. Power View (the core feature of Power BI): Most likely, you’ll be using this feature to create an interactive dashboard and visualize your data to tell your story and deliver your insights. Power Map: If your data and analysis has a geo location dimension, this feature is a must. Play around with 3D and 2D visualizations to optimize the delivery of your message. Q&A*: If you have quick and interesting findings that can be shared via a couple of questions, Q&A is a feature you’ll want to use. A set of these short questions can help you outline how you came up with your story and final demo. It can also be a great follow-up to your main story. Mobile: The Windows 8 mobile app is the perfect way to consume data created with Power BI on the go. If your demo has a real-time data component, consider showing how Power BI performs in this environment. Sites: If the story behind your data includes a collaboration component, the Power BI site experience might be useful for showcasing it. * Q&A preview is currently available only for the samples provided. We are working to make this feature available for personal workbooks on our preview before the submission deadline so you can use it in your demo. Please check this blog regularly for news around this subject. Camtasia: one of the best screen capture software available today.